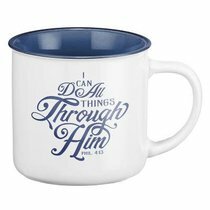 :Philippians 4:13 says, â€œI can do all things through Him.â€ The I Can Do All Things Camp-Style Mug, which features Philippians 4:13 reminds us that the Lord is able to provide strength for the seemingly impossible. The bold font on the front of this mug alternates between block and script lettering. This mug makes a thoughtful gift for anyone who may appreciate the reminder that the Lord is near to those who love Him. About "Camp Style Ceramic Mug: I Can Do All Things Through Christ....White/Blue (Phil 4:13)"